A former NFL star has said a photo of him holding a gun while standing between his daughter and her prom date “was obviously intended to be a joke”. 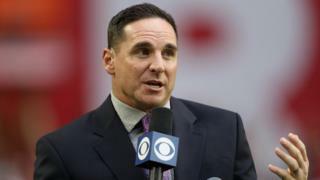 Jay Feely, a kicker who played for several teams from 2001-14, was excoriated online after posting the photo to Twitter on Saturday. On Sunday, the 41-year-old went back on Twitter to say the couple have dated for over a year and knew he was joking. Feely said the pistol was not loaded and he takes gun safety seriously. In Saturday night’s tweet the father-of-four wrote: “Wishing my beautiful daughter and her date a great time at prom #BadBoys”. After an online backlash, Feely wrote on Twitter on Sunday: “The prom picture I posted was obviously intended to be a joke. “My Daughter has dated her boyfriend for over a year and they knew I was joking. Feely is an American football analyst for CBS Sports who lives in Arizona, according to his Twitter biography. There are legit things to get all worked up about. This isn’t one of them. It’s a joke and the “protecting your daughter with a gun” joke is as old as dirt. It’s a nice 1911 though. And regarding the dad joke aspect, one of the first rules of gun safety is to never treat a gun like a joke or a toy. Lots of people have been shot with guns that were thought to be unloaded. Jay Feely failed that test with his photo.